Shah Rukh Khan (pictured in 2017) received several awards and nominations for his performance in My Name Is Khan . My Name Is Khan is a 2010 Indian drama film directed by Karan Johar, produced by Hiroo Johar and Gauri Khan, and starring Shah Rukh Khan and Kajol in lead roles. The film was jointly produced by Dharma Productions and Red Chillies Entertainment and was distributed by FOX Star Entertainment, which had bought the rights for the film for a sum of ₹100 crore, making it the most expensive Bollywood film of 2010. It is also the highest buy over for any Indian film, surpassing Ghajini's record of ₹90 crore. Produced on a budget of ₹850 million (about US$19 million in 2010),  [lower-alpha 2] My Name Is Khan was released on 12 February 2010 and received positive reviews. It was commercially successful, grossing ₹2.048 billion (about US$45 million in 2010) worldwide. [lower-alpha 2] The film won 25 awards from 84 nominations; its direction, story, screenplay, performances of the cast members and music have received the most attention from award groups. The Indian rupee sign is the currency symbol for the Indian rupee, the official currency of India. Designed by Udaya Kumar, it was presented to the public by the Government of India on 15 July 2010, following its selection through an "open" competition among Indian residents. Before its adoption, the most commonly used symbols for the rupee were Rs, Re or, in texts in Indian languages, an appropriate abbreviation in the language used. My Name Is Khan led the 56th Filmfare Awards with ten nominations including Best Film (Hiroo Yash Johar, Gauri Khan) and Best Music Director (Shankar–Ehsaan–Loy). It went on to win four including Best Director (Johar), Best Actor (Khan) and Best Actress (Kajol). The film won five awards out of eight nominations at the 12th IIFA Awards, including Best Director (Johar), Best Actor (Khan) and Best Lyricist (Iyengar for "Sajda"). It garnered fourteen nominations at the 6th edition of Producers Guild Film Awards, with Johar winning for Best Director. At the Zee Cine Awards 2011, the film earned six wins out of eight nominations, including those for Best Director (Johar) and Best Actor – Male (Khan). Among other wins, My Name Is Khan received four Stardust Awards, three Screen Awards, two Mirchi Music Awards and a BIG Star Entertainment Award. The 56th Filmfare Awards were held on 29 January 2011 at the Yash Raj Studios in Mumbai, honouring the best in film for the year 2010. The nominations were announced on 13 January. The date of the function was unusual because generally the awards are hosted on the last Saturday of February. The date of the telecast is 6 February 2011. The Filmfare Best Music Album Award is given by the Filmfare magazine as part of its annual Filmfare Awards for Hindi films, to the best composer/arranger of a soundtrack. This category was first presented in 1954. Naushad Ali was the first recipient of this award for his song "Tu Ganga Ki Mauj" from the film Baiju Bawra. For the first two years, it was awarded to the composer for a particular song and not the entire album. From 1956 onwards, awards in this category have been given for the entire soundtrack. From 2017, the name of this was category changed from best music direction to music album. ↑ Awards in certain categories do not have prior nominations and only winners are announced by the jury. For simplification and to avoid errors, each award in this list has been presumed to have had a prior nomination. ↑ Date is linked to the article about the awards held that year, wherever possible. 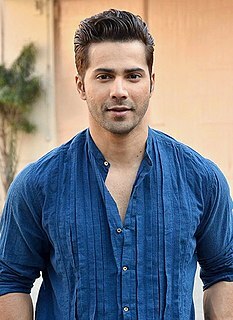 Varun Dhawan is an Indian actor. One of the country's highest-paid celebrities, he has featured in Forbes India's Celebrity 100 list since 2014. Each of the eleven films in which he has starred were commercially successful, establishing Dhawan in Hindi cinema. Ankit Tiwari is an Indian playback singer, music director, composer and also an actor. His career began upon meeting Pradeep Sarkar where he got a chance to work on jingles and started composing background music for television programmes. Subsequently, he was offered to compose music for Do Dooni Chaar (2010) and Saheb, Biwi Aur Gangster (2011), where he started his singing career with the song he composed for the later. ↑ Miriam, Simra (20 November 2017). "'My Name Is Khan': A Film That Still Finds Relevance Today". HuffPost . Archived from the original on 10 February 2018. Retrieved 10 February 2018. 1 2 "My Name Is Khan Cast & Crew". Bollywood Hungama. Archived from the original on 10 February 2018. Retrieved 10 February 2018. ↑ Weissberg, Jay (12 February 2010). "My Name Is Khan". Variety . Archived from the original on 12 February 2018. Retrieved 12 February 2018. Saltz, Rachel (12 February 2010). "A Hero Begins His Quest, and Then the Trouble Starts". The New York Times . Archived from the original on 12 February 2018. Retrieved 12 February 2018. 1 2 "My Name Is Khan". Box Office India. Archived from the original on 13 February 2018. Retrieved 13 February 2018. ↑ "Rupee vs dollar: From 1990 to 2012". Rediff.com. 18 May 2012. Archived from the original on 21 March 2015. Retrieved 13 February 2018. ↑ "Shah Rukh Khan's 'My Name is Khan' best film: Paul Coelho". The Financial Express . Press Trust of India. 8 August 2015. Archived from the original on 13 February 2018. Retrieved 13 February 2018. ↑ "My Name Is Khan (2010)". Rotten Tomatoes. Archived from the original on 13 February 2018. Retrieved 13 February 2018. 1 2 "Nominations for 56th Filmfare Awards 2010". Bollywood Hungama. 14 January 2011. Archived from the original on 4 February 2018. Retrieved 4 February 2018. 1 2 "All Filmfare Awards Winners". Filmfare . Archived from the original on 4 February 2018. Retrieved 4 February 2018. ↑ "Nominations of BIG Star Entertainment Awards". Bollywood Hungama. 16 December 2010. Archived from the original on 10 February 2018. Retrieved 10 February 2018. ↑ "Dabangg bags five awards at Big Star Entertainment Awards". NDTV. Indo-Asian News Service. 22 December 2010. Archived from the original on 16 April 2015. Retrieved 10 February 2018. ↑ "Nominations Floriana IIFA Awards 2011 Popular Awards Nominations – 1". International Indian Film Academy. Archived from the original on 14 January 2012. Retrieved 4 February 2018. ↑ "Nominations Floriana IIFA Awards 2011 Popular Awards Nominations – 2". International Indian Film Academy. Archived from the original on 8 May 2012. Retrieved 4 February 2018. ↑ "Nominations Floriana IIFA Awards 2011 Popular Awards Nominations – 3". International Indian Film Academy Awards. Archived from the original on 27 November 2012. Retrieved 4 February 2018. ↑ "IIFA Through the Years – IIFA 2011 : Toronto, Canada". International Indian Film Academy. Archived from the original on 4 February 2018. Retrieved 4 February 2018. ↑ "Intro Note". Radio Mirchi. Archived from the original on 10 February 2018. Retrieved 10 February 2018. ↑ "Winners". Radio Mirchi. Archived from the original on 10 February 2018. Retrieved 10 February 2018. ↑ "Listener's Choice". Radio Mirchi. Archived from the original on 10 February 2018. Retrieved 10 February 2018. ↑ "Mirchi Music Awards 2010 Winners". The Times of India . 29 January 2011. Archived from the original on 10 February 2018. Retrieved 10 February 2018. ↑ "Nominees". Radio Mirchi. Archived from the original on 30 January 2011. Retrieved 30 September 2018. ↑ "6th Apsara Producers Guild Awards Nominees". Producers Guild Film Awards. Archived from the original on 4 February 2018. Retrieved 4 February 2018. ↑ "6th Apsara Producers Guild Awards Winners". Producers Guild Film Awards. Archived from the original on 4 February 2018. Retrieved 4 February 2018. ↑ "Salman named best actor, Dabangg best film at Apsara Awards". Sify. Indo-Asian News Service. 12 January 2011. Archived from the original on 4 February 2018. Retrieved 4 February 2018. ↑ "Nominations for 17th Annual Star Screen Awards 2011". Bollywood Hungama. 3 January 2011. Archived from the original on 4 February 2018. Retrieved 4 February 2018. 1 2 "Winners of 17th Annual Star Screen Awards 2011". Bollywood Hungama. 6 January 2011. Archived from the original on 4 February 2018. Retrieved 4 February 2018. ↑ "Star Screen Awards: B-Town's Big Night". The Indian Express . 8 January 2011. Archived from the original on 4 February 2018. Retrieved 4 February 2018. ↑ "Nominations of Stardust Awards 2011". Bollywood Hungama. 22 January 2011. Archived from the original on 4 February 2018. Retrieved 4 February 2018. ↑ "StardustAwardWinner2011". Stardust . 9 February 2011. Archived from the original on 12 February 2011. Retrieved 4 February 2018. ↑ "Pix: Big B, Madhuri at Stardust Awards". Rediff.com. 7 February 2011. Archived from the original on 4 February 2018. Retrieved 4 February 2018. ↑ "Nominations for Zee Cine Awards 2011". Bollywood Hungama. 1 January 2011. Archived from the original on 4 February 2018. Retrieved 4 February 2018. ↑ "Winners of Zee Cine Awards 2011". Bollywood Hungama. 14 January 2011. Archived from the original on 4 February 2018. Retrieved 4 February 2018. ↑ "Hrithik, SRK top Zee Cine Awards". Hindustan Times . 15 January 2011. Archived from the original on 4 February 2018. Retrieved 4 February 2018.